As we age, our bodies become more and more susceptible to a myriad of negative occurrences: excessive tiredness, arthritis, illness, and a general wearing down. All these things and more can make it harder and harder to navigate through life. Everyday activities like heading upstairs pose a tougher challenge than they did in our youth, especially if you use a wheelchair. Just because you’re in a wheelchair, however, doesn’t mean you can’t enjoy all the freedom and independence you’ve enjoyed in the past. A platform lift may be the solution you or your loved one’s needs. With a top-notch platform lift, you can get over stairs and platforms that are too high to tackle with a ramp, and continue going about your day without stressing about getting from point A to point B or trying to do so in a manner that could post danger to you. We’ve sourced some of the best platform lifts on the market that will help you through a variety of scenarios. Who Needs a Platform Lift? Where Will a Platform Lift Go? How Do I Choose a Platform Lift? This wheelchair lift is a great choice for outdoor use to get you up and over any front porch with a reliable, smooth ride. Those who use wheelchairs may find challenges right on theirownproperty, starting with their very own front porch. The Electropedic Wheelchair Elevator Vertical Platform Home Porch Lift is an excellent choice for immobile persons whose home has a porch that they need to move onto every day. This platform lift is designed to be safe and smooth. Ideal for indoor or outdoor use, the motor andelectrical box are top-mounted, keeping them off of the ground and out of danger of sitting in water. This design also makes it easier to service given the chance that there’s a technical difficulty or problem with its operation. The straight-through platform utilizes a non-skidmaterial with a fixed ramp. A grab rail and 42-inch high guard panels add to the machine’s safety and convenience. An easy-to-use panel switch lets users operate with ease, and the emergency stop button halts the machine should something go wrong. Although this lift is pricy, it ensures mobility on your own front porch so you can age in place without undergoing even costlier renovations. If you’re looking for a lift that will last, we highly recommend this model. It’s durable, yet lightweight. While the Ez-Access Passport Vertical Platform Lift is knownon the market as the lightest home platform lift, it still holds its own when it comes to durability and toughness. 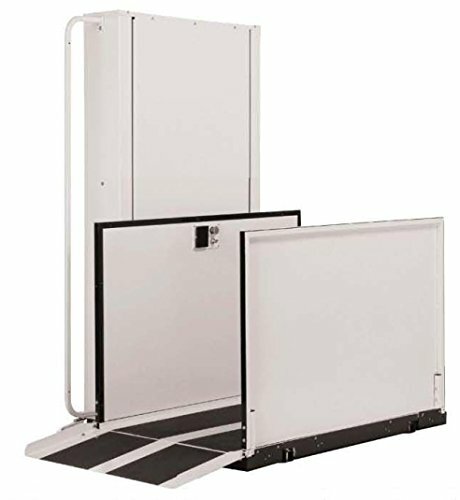 Independently tested and approved for safety, this platform lift is rated to hold up to 750 pounds while remaining smooth and quiet. The prewired platform tower and gate gives users easy installation, making it easier on caregivers and their loved ones. Waterproof switches ensure this lift will last long, and the product design bodes well for various temperature ranges. Highly energy efficient, the battery lasts long, which results in less wear and tear on the motor. The platform easily charges in standard outlets, making continual use easy to manage. As a heavy duty lift, seniors who are permanently in a wheelchair should look to this option as a great choice for aging in place. As you’re preparing your home for your needs as a senior, products that last longer will help greatly since they’ll require less maintenance and updating. For as little as half of its competitors, you get the same ease of use and reliability with this model. Lifting height: 4'-6' (53" to 77"), Rated load 600 pounds (272 kg). For nearly half the price of other platform lifts of its kind, you or your loved one can save by choosing the Electropedic Wheelchair Elevator Platform Porch Lift RPL. Simple and easy to use, the automatic folding access ramp adds convenience, while the non-skid surface boosts safety for your loved one to enter. With a water-resistant design, you can feel secure using this deviceboth indoors and outdoors. The control paddle switch is basic, without complicated instructions or use, and it includes an emergency stop button for dangerous situations. In addition, sensitive safety sensors on the bottom will automatically stop the lift should it detect something is in the way. 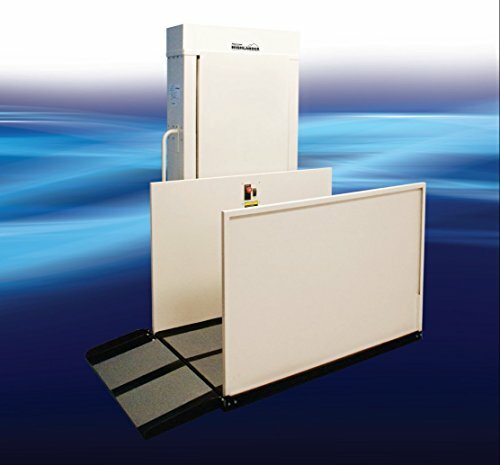 High guard panels ensure your loved one won’t go anywhere while using this lift. An added handle on the inside gives them something to hold onto while in motion. If you’re maneuvering a staircase, this inclined platform lift will do the job best. Many platformlifts come in the form of a straight vertical lift. However, this platform lift is a little bit different to suit a different type of need. While a porch lift simplyelevates people above a small set of stairs, the Sierra Inclined Stair Platform Lift is bestusedin the home to conquer large staircases. Without making major renovations, you or your loved one can enjoy convenient assistance maneuvering in-home staircases with this platform lift, increasing independence for those in wheelchairs. While this lift certainly supports wheelchairs, buyers also have the option to include a fold-downseat to use as a basic stairliftwithout a wheelchair. At the same time, wheelchair users can fold this chair up and use it as a lift as well. This platform stair lift offers many optional add-on features, including several safety features and convenience items, such as fold-down seats and track extensions. With those in mind, anyone can customize the lift to meet their needs and feel independent without sacrificing the home they love. A platform lift is a machine designed to provide more access and mobility for seniors who permanently use wheelchairs. These products typically include some kind ofenclosed platform that safely and smoothly transports a person up and above stairs so they don’t need to use a steep ramp or worry about costly renovations to a home where they’d otherwise like to age in place. Many of these platforms are specifically madefor wheelchairs. However, some may include fold-down chairs for someone who doesn’t necessarily need a wheelchair, but still has difficulty walking up or down stairs. Some platform lifts simplylift vertically, while others are designed to move up on an incline over larger staircases. In some cases, wheelchair ramps are enough to make it easier for an individual to get around. Unfortunately, that is not always the case. But how can you know which one will be the best solution for you or your loved one? Well, the first thing to think about is your personalsituation. Are you facing difficulty accessing or climbing the staircases in your home? Has your loved one started using a wheelchair full-time but lives alone in a house with a high front porch? Perhaps a disease or injury has created more immobility that needs to be addressed so they can live comfortably. These are cases where it may be best to consider further assistance. More than 15 million people in the United States are using crutches, walkers, a cane, or a wheelchair. Most of these cases could benefit from using a platform lift so they can move about as easily as possible without possibly harming themselves. The next thing to consider is the space you’re allotted. Most general wheelchair ramp codes require that a ramp has an additional foot of length for every inch of rise. Thismeans that a house with a 30-inch porch will require a 30-foot long ramp. Not every yard has that capacity. If that is the case for you or your loved one, you may decide that a platform lift will work better for the space you have. Typically, a vertical platform lift will only take up about 5 x 5 feet. If you don’t have enough space inside or outside your home for a long ramp, you may be a perfect candidate for a platform lift. The first factor to consider is this: what are you trying to maneuver? Is your front porch your obstacle, or is it a staircase to the second floor of your home? If your answer is the front porch, you will want to look into a regular platform lift. This device is designed to lift you and your wheelchair straight up and meet the utmostlevel of your front porch. If your answer was the latter, an incline lift is more suited to your needs. Incline lifts do the same thing—lift you and your wheelchair above steps—but it moves upwards on a diagonal to get you up a long set of stairs and onto the next floor. Once you have figured out your specific use for a lift, it’s important to consider the factorsof each brand you look into. Safety is always key. Look for lifts that includeautomatic ramps and non-skid platform surfaces. Platform lifts with handlebarsare great because they give the user something to hold onto. Many lifts feature sensors that will automatically stop the lifting process should something obscure its path; this is an awesome feature to have. You should also pay attention to the control system on the lift. Most are automatic and can operate with the push of a button, but some may be manual and require a hand crank to get the lift to operate. These types of lifts won’t be a good option for seniors suffering from arthritis or who have limited mobility. Especially if they’re using a wheelchair, it could be difficult to operate the lift if they need to do much else than push a button. Convenience and longevity are important as well. If this lift is for your porch, it is vital to make sure the product is weather-resistant. Make sure you canoperate the machine, especially if you live alone and intend on keeping it that way. A heavy-duty lift that can last for many years will ensure that once it’s installed you won’t need to worry about it again while you’re aging in place. Other options might need more maintenance and updates, and could end up costing you more. Using a wheelchair doesn’t mean life as a capable individual is over, and it shouldn’t mean you have to find a new home just because your house has stairs. The right platform lift or stair lift can increase your independence and allow you to continue living the lifestyle you love, inside the home that you love.